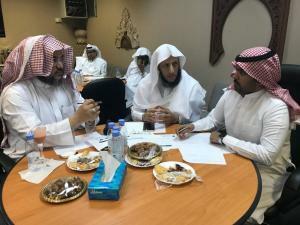 To keep pace with the development movement witnessed in all fields in the university, the College of Shari`ah and Islamic Studies, represented by the College Vice Deanship for Training and Community Service, held a workshop entitled (Umm Al-Qura 2030) on Monday, 4 Rajab, 1440 A.H., corresponding to 11 March, 2019 A.C. The course was presented by the Vice Dean of the College for Training and Community Service, His Excellency Dr. Ibrahim Atiyyah Al-Sulami, together with the Vice Dean of the College (female section), Dr. Maha Al-Utaibi, in the presence of a large number of male and female vice deans of the college and deanships and the deputy director of the Vision Initiatives Management Office. The workshop was launched by the speech of the Dean of the College of Shari`ah and Islamic Studies, His Excellency Dr. Ra'id bin Khalaf Al-Asimi, in which he welcomed the attendees and confirmed the role of the Shari`ah College as a source of strength for Umm Al-Qura University. After that, Dr. Ibrahim started the first theme of the workshop entitled, “Where Will Umm Al-Qura University Be After 10 years?”. The audience enriched the workshop with purposeful discussions and enterprising ideas. 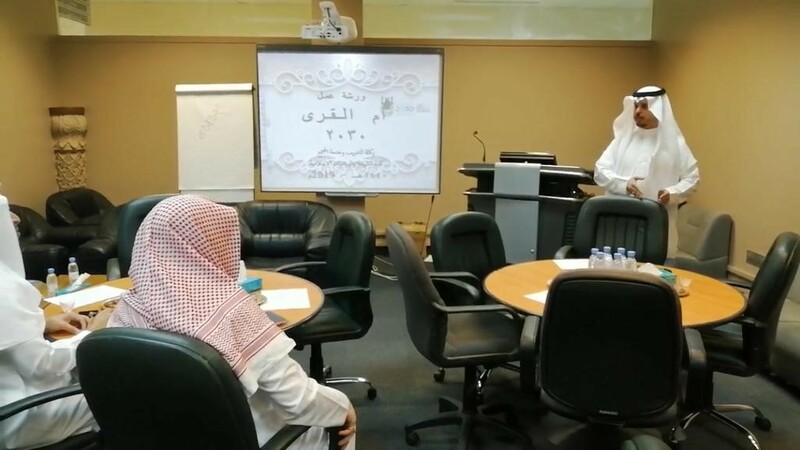 Wrapping up the workshop, valuable recommendations were submitted for the benefit of Umm Al-Qura University. These recommendations will be forwarded, Allah willing, to the university leadership.